Last year I did not go home for Thanksgiving so this year I decided to go and be with the family in Florida. On Thanksgiving afternoon, we all gathered at St. Richard Church in Miami, where my cousin Rob is the deacon. We celebrated Mass there and offered thanks for all of God’s blessings upon us, our country and our Church. We also prayed in a special way for my Aunt Marie May, who has just undergone open heart surgery and has come through it very well. Afterwards, we had dinner at the home of my cousin, Kelly Mulligan, and her husband Danny — just a few blocks from St. Richard’s. We had beautiful weather for the meal and we were able to eat outside. There were many cousins and other relatives who joined us for the occasion. Altogether, there were about 50 or 60 of us for dinner. 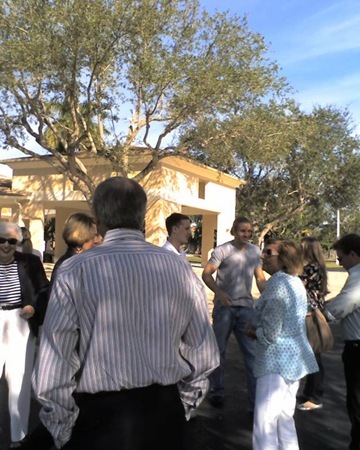 My family in Florida is very close-knit and they are always looking for opportunities to come together. It is a joy to be part of these family celebrations. It is always a wonderful opportunity to catch up with the family and hear how everyone is doing. Friday, I went with Claire O’Malley to visit my aunts, Patricia O’Malley and Kitty O’Malley, and sit out on their porch. 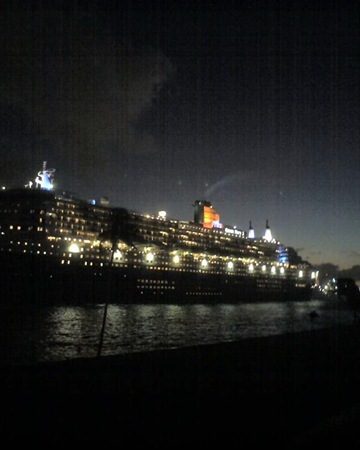 Aunt Patricia lives in Fort Lauderdale at Port Everglades, and there we watched the cruise ships pass by within a few yards of us. It was quite a show. 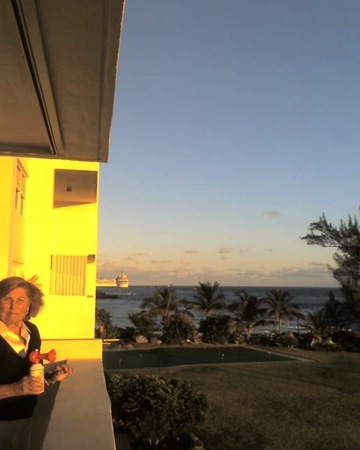 As the ships pass by, Aunt Patricia gives a blast of her boat horn as a sort of hello. 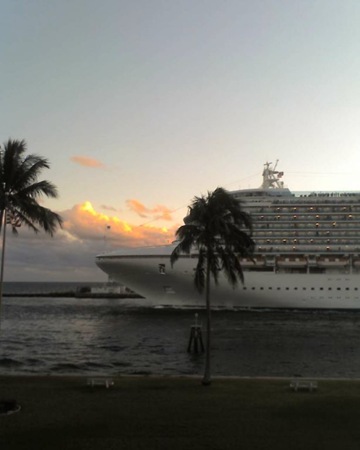 The ships usually respond back with their horn! Monday, Father Matt Williams invited people involved in youth ministry to come to an Advent program here at the Pastoral Center. First of all, we wanted to acquaint them with the center and the different services that are available here. It is all part of our strategy of getting people to work together, such as the Vocations Office, our Marriage Ministry, our Campus Ministry and the Religious Education Office. Secondly, it was a chance to personally thank so many people who are doing so much for the youth ministry in their parishes. Father Matt also shared with them about the experience of last summer’s events, such as World Youth Day. 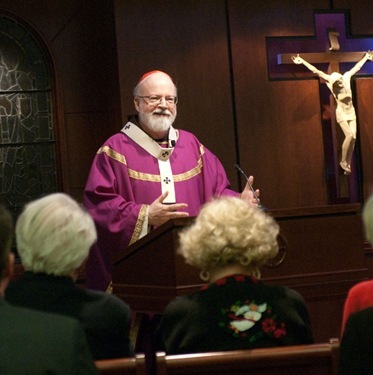 He encouraged them to get ready for the coming March for Life in Washington Jan. 22. He also spoke to them about our new monthly meetings in the North End for young adults. It was a great meeting and opportunity for everyone to network with each other. Following the meeting there was a very beautiful Holy Hour. 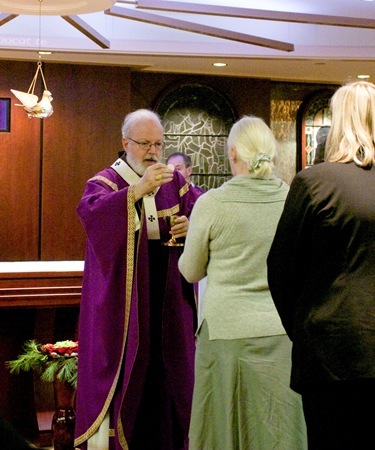 Tuesday, we celebrated an Advent Mass for the Order of Malta here at the Pastoral Center’s Bethany Chapel. 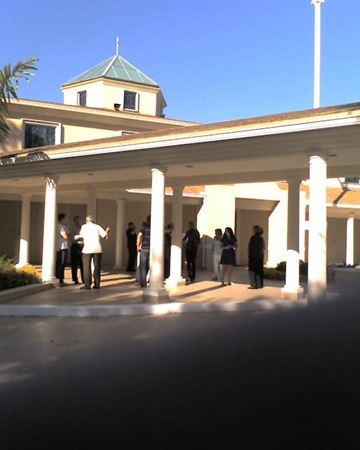 For many of the knights and dames it was their first time at the Pastoral Center. The Boston Area Order of Malta holds its annual Mass and dinner at Boston College in October. 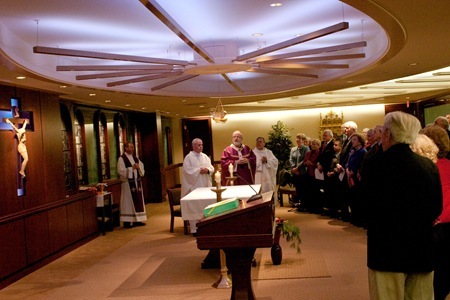 Last week’s additional gathering at the Pastoral Center provided the membership the opportunity to see our new Archdiocesan headquarters. 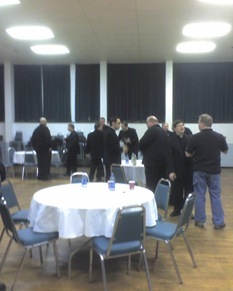 After the Mass we all had dinner, where we heard from Father John McLaughlin about his new ministry. 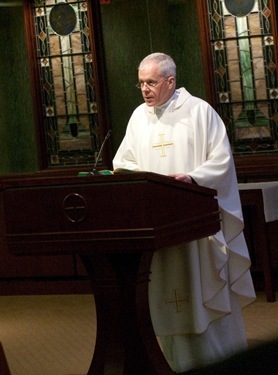 Father McLaughlin is the new vocations director for the Archdiocese for the Military Services, which serves those who serve in the armed forces. It was very encouraging to hear about his work. 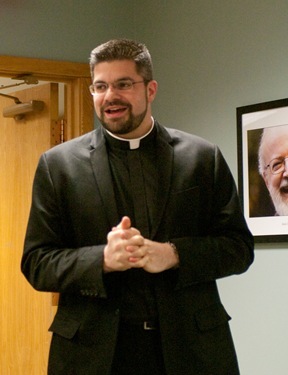 He only started a few months ago and already heard from a hundred individuals, either priests looking to be chaplains or young men interested in entering the seminary. 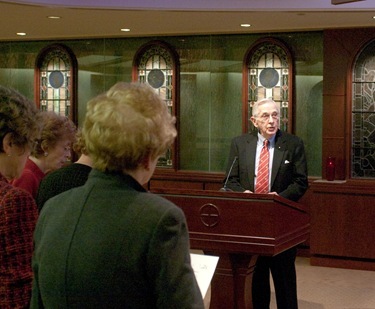 He said he has also heard from women interested in joining religious life. 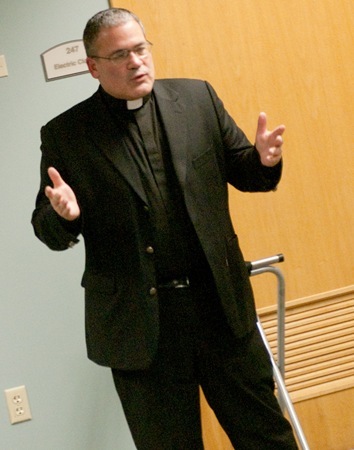 Father McLaughlin is there to help them in that process of discernment and to encourage them. 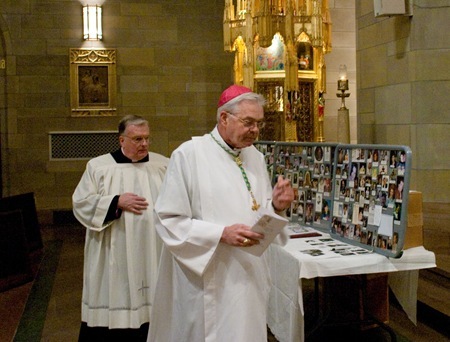 One of the interesting statistics Father McLaughlin shared with us is that nearly one-tenth of the ordinations each year are men who have been in the military. I was very happy to hear his remarks. He gave a very engaging talk about his own vocation and the experience of doing his work. 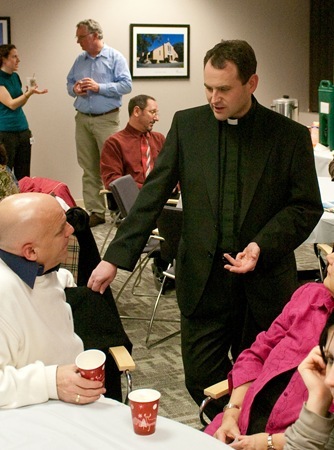 Father McLaughlin is on loan for three years in this ministry, so we are pleased it is making an impact. I am very pleased because it was a great sacrifice for us because he was at St. Monica’s in Methuen, where he was the pastor and doing a fantastic job. However, if it helps the Church in the whole United States, then it is worth it. 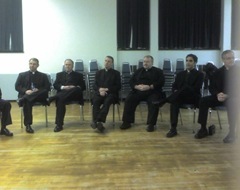 On Wednesday I met with the recently ordained priests of the archdiocese. 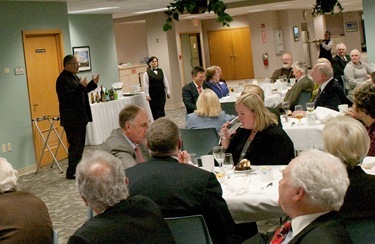 In each diocese where I have been bishop, I have tried to gather with the younger priests for prayer, a shared meal and conversation—as part of their ongoing formation following the Jesu Caritas format. 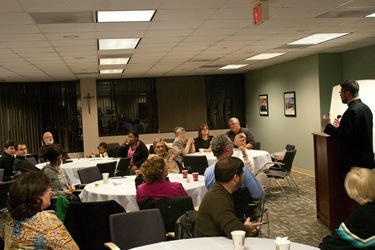 Our meeting was hosted at Holy Name in West Roxbury. 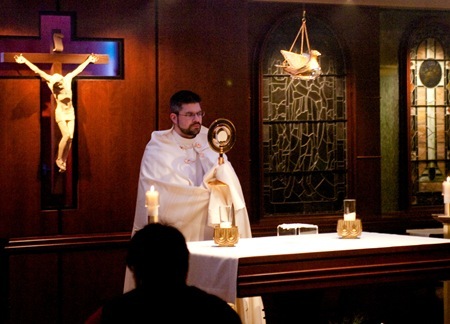 Father Marty Dzengelski is one of the recently ordained priests and he is stationed there. Typically, we have 25 to 30 priests come to the meetings. As part of our conversation, we talked about the economic crisis and how to minister to our people in this time of economic uncertainty. It is a time when some of our parishioners are losing their homes and losing their jobs. People are worried about tuition payments and mortgage payments. 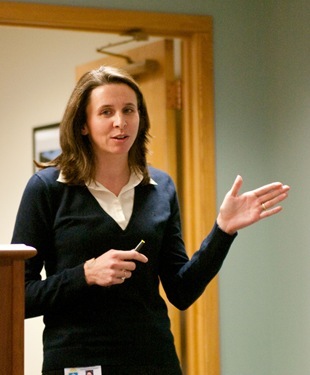 We also talked about some of the root causes of this crisis and the commercialism of our age. 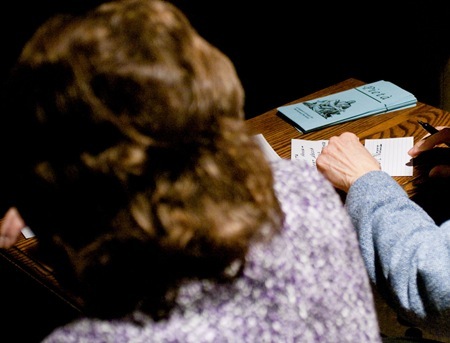 We want our parishes to be communities that are supportive of parishioners who are in tough times and facing economic difficulties. It was interesting to hear the young priests exchanging their ideas, thoughts and experiences of what is happening in their parishes. I was pleased to learn that all the parishes in which they work have St. Vincent de Paul Societies, which are a wonderful way for local communities to respond to the material and spiritual needs of the poor in their own parishes. Our Catholic Charities and other social services agencies, such as the soup kitchens and food pantries are strained by the current situation. They are having difficulties keeping food stocked on the shelves. Recently, I visited the friars at Arch Street and they have come up with very creative solutions for food distribution. I was very encouraged by what they are doing there. Certainly, the efforts of programs like Cor Unum in Lawrence take on an even greater importance as we go through this recession. 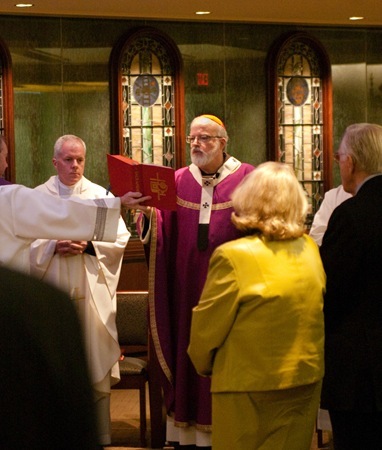 It was good for us, as priests, to reflect on these problems that our people are facing. We need to share ideas on how to give them the support they need, to accompany them and help them interpret what God is saying to us in these events. Also at the meeting I shared with them that I will be giving a talk at an international priest retreat organized by the Congregation for the Clergy that will take place next fall in Ars, France. I asked Father Kelly, who works in our clergy support office, to organize a group of Boston priests to go with us. A few years ago, the last time we had this type of event, the retreat was held in Malta. 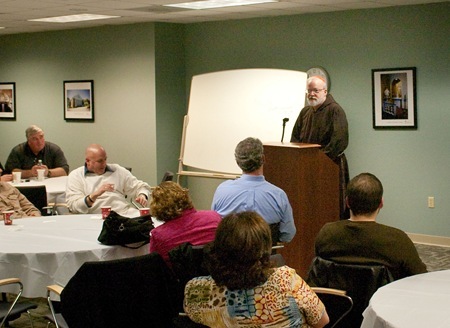 I was asked to address that gathering also and we took some priests form Boston and it was an awesome experience. We are hoping this year, the 150th anniversary of the Cure d’Ars, St. John Vianney, who is the patron saint of diocesan priests, to bring a good contingent of Boston priests to Ars for this retreat. 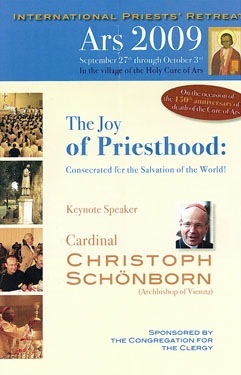 Typically, 1,300 to 1,400 priests from all over the world attend and there are some very interesting speakers. We are really looking forward to it. 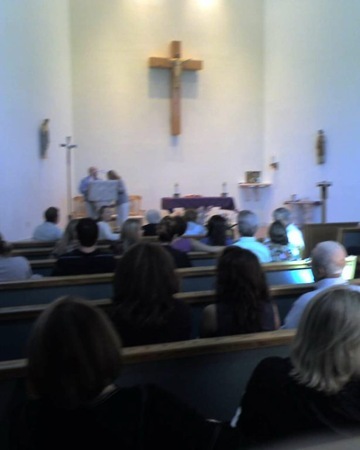 Wednesday night, I attended the annual lighting service for Pieta, a support group for parents who have lost children as they marked the 25th anniversary of the organization. 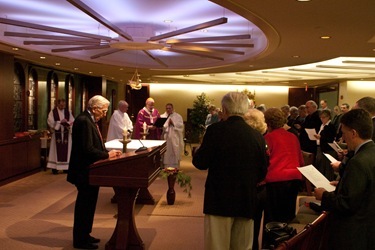 They meet on the first Wednesday evening of the month at Walpole’s Blessed Sacrament Church. This time, the service was held at St. Teresa’s in West Roxbury and it was a very moving experience to be in a church full of parents — some older, some younger — who either recently or in the distant past lost a child. 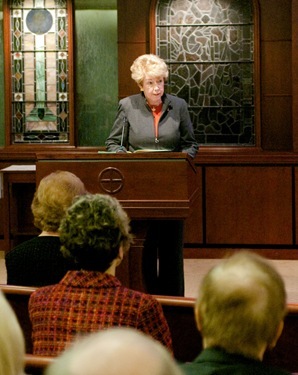 Bishop Dooher preached to them and presided over the service and I spoke and gave the final blessing. 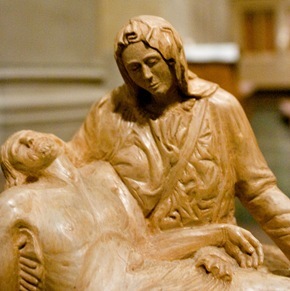 The name Pieta harkens to the Michelangelo’s sculpture of Our Blessed Mother receiving the dead body of her son on Good Friday after he was taken down from the cross. 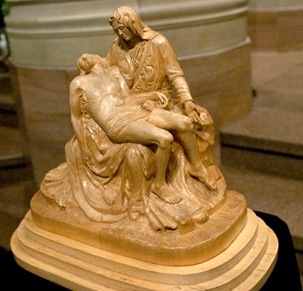 Basil LeBlanc displayed his own basswood carving of the Pieta on the altar next to the hundreds of photographs the parents had posted on boards. It was a powerful way to help contemplate the tragedy of parents who lost children. The two founders, Barbara Waters and Jo Musco Callari, both lost daughters in the same car accident 28 years ago. Barbara spoke at the service about her own struggle and then she described the very meaningful ways in which different parents have memorialized their children. One mother, whose daughter who was murdered by her husband, has become active in advocating against domestic abuse and she is involved in shelters for abused women. 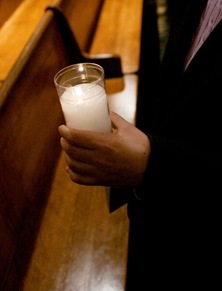 One father of a son killed by a drunk driver went into the prison to meet and forgive the driver. 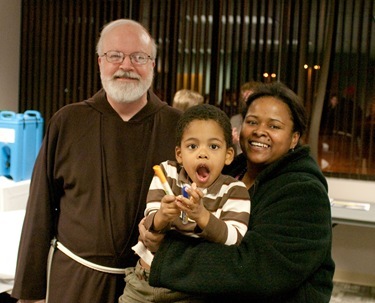 Some parents have established scholarships and others have performed works of mercy in honor of their children. It was just a moving experience to be there with those parents. 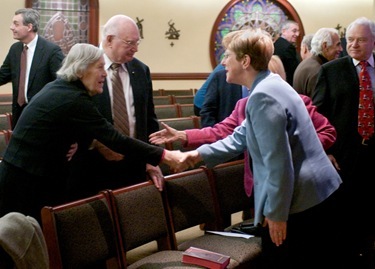 It was also encouraging to see how they gather and find mutual support by sharing prayer and stories with each other. And, finally, just today we learned the sad news of the passing of His Holiness Alexy II, Patriarch of Moscow and All Russia. We offer our condolences and the assurance of our prayers to the people of the Russian Orthodox Church. 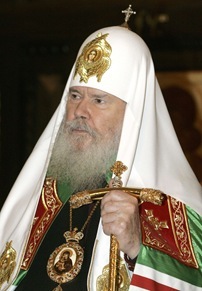 Patriarch Alexy presided during a time of great challenge as the repression of religious freedom in Russia and the former Soviet republics gave way to a renewal of spiritual life and practice. As we commend the Patriarch’s soul to God’s eternal mercy, we give thanks for all his works undertaken in the name of the Lord and we pray for the day of the fulfillment of Jesus’ prayer that all who believe in Him may be one.